[X] » Meinrad Rumely Dead. It is with a sense of personal loss that we learn of the death of Meinrad Rumely, the founder of the M. Rumely Co., of La Porte, Ind., which occurred March 31. From the La Porte Herald we take the following sketch of the life of the grand old man of La Porte, at whose passing the city bows in grief. Meinrad Rumely was born in Adelsberg, near Zell, Baden, Germany, Feb. 9, 1823 just a little over 81 years ago. He was 25 years old when he concluded to come to America. to join his brother, Jacob Rumely, who was then engaged in the manufacture of pumps at Canton, Ohio, at which place he had located in 1847. After remaining for a time at Canton the ambitious young man proceeded to Massillon, afterward went to Piqua and later on secured a position in Pittsburg. He had learned the machinist trade and his positions were in plants where mechanics were employed. His desire was to go further west and so he went to Chicago, but did not like it and pushed on to Milwaukee, later on going to St. Paul. He then visited Lafayette, this state, and while there was induced to come to LaPorte, This was in 1853, when the place was but a small town. In the meantime another brother, John Rumely, had left the parental home in Germany and had journeyed to the land of promise. He had located in Canton, where he was employed by his brother Jacob, who afterward left that city and went to Missouri, but returned before his death in 1874 to the town that was the home of President McKinley. Shortly after his arrival in LaPorte, Meinrad Rumely induced his brother John to come to LaPorte and the two then opened a machine repair shop in a building near where the present office of the M. Rumely Company is now located. As the business increased the brothers took up manufacture of horse powers and sugar cane crushers. The firm name was M. & J. Rumely. In 1857, nearly 50 years ago, the making of threshing machines was commenced and from that time on, the plant grew and flourished, its products became know in every clime where grain is harvested and where steam engines are used, for the goods bear the stamp of stability and thorough workmanship upon them. Early in its existence the firm also made castings for the Michigan Southern and Northern Ind. railroad, now Lake Shore and Michigan Southern, the car shop being then located in this city. 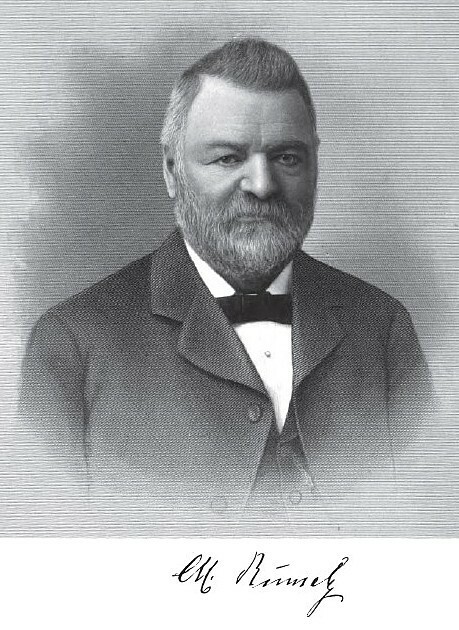 In 1882 Meinrad Rumely purchased the interest of his brother, John Rumely, who died February 9, 1894, and continued the sole owner until 1887, when the M. Rumely Company was incorporated for a quarter of a million dollars, with Meinrad Rumely as president and general manager. These positions he filled until his death. Previous to his illness he devoted much of his time to the management of the large plant and every day found him at the works carefully noting all that transpired and giving directions. No change or improvement was undertaken excepting under the direction of the president, whose heart was in the institution that he had watched grow as a father would a child, giving it every care and attention that would be to its upbuilding and future good. The ways of him who rules over this universe are beyond comprehension. Had Meinrad Rumely survived another year and 20 days more the venerable citizen and manufacturer and his estimable wife would have celebrated the golden anniversary of their marriage, for on April 19, 1855, at Canton, 0., Rev. Father Arnold united in marriage Theresa Fierstos and Meinrad Rumely. It was a union blessed with all that was noble and good. Of the nine children that were born to the couple, eight, all of whom are an honor to their parents, survive, with their mother, to mourn a loving and devoted husband and the four sons, Joseph J., William N., Meinrad C. and Aloysius J. Rumely, are residents of LaPorte, as are slas two of the daughters. Mr. Rumely was a deeply religious man. His devotion to his church was marked, while his charitable work was unostentatious. In promoting the welfare of LaPorte and adding to its worth and importance before the world, no man ever took a greater interest than did Mr. Rumely, whose heart was in every project that meant a forward step in the progress of the city that was home to him. Several of the manufacturing institutions that now flourish in this city are indebted to the aid and the encouragement which they received from the deceased. He started in business in times that were as different from these times as can possibly be imagined, but he was always master of the situation. He kept step with the progress of the period. He did not lag, neither was he too precipitate. Every movement was well calculated beforehand. He always struck when the iron was just the proper heat; and so he kept his place in the great race of life. He did not crowd out anybody else, he oppressed no one, he deceived no one. He was content to do his part honestly and well. Thoroughness was one of his attributes, and thus step by step, year by year, improvement after improvement, building after building, the growth 'of the great Rumely enterprise went ou, overshadowing other enterprises, distancing many, keeping pace with all, until the name Meinrad Rumely became a household word in more than one section of this great country. Mr. Rumely demonstrated that aptitude for a chosen pursuit, perserverance under most discouraging circumstances, business and mechanical ability of a high order are some of the qualities he possessed. His love for his family was shown in his devotion to it; his kindness to and appreciation of his workmen were indicated by their faithfulness to him; his admiration for LaPorte and its citizens was manifested by his long residence in the city and his great efforts to build up here an enterprise which should be worthy of its projectors and worthy of LaPorte. The worth of such a man as Mr. Rumely to a city like LaPorte was of incalculable advantage in the example he set of the domestic virtues, in his religious and business life, and in the great monument he erected for himself and the city through years of toil and of gratifying triumph.